Women in Cybersecurity: Is This a Good Time? It is estimated that women make up 11 percent of the cybersecurity workforce. There’s no question that we need to get more women involved, especially as we move into this Internet of Things (IoT) era where data volumes are growing exponentially, and information security continues to be a hot topic amongst IT, executive boards, and everyone in between. In this all-women panel discussion, Tamara Dull will be talking with cybersecurity experts about its threat, the impact of technology, why women need to be involved, their advice for President Trump, and the landscape moving forward. Come prepared to listen, learn, ask your questions, and have a good time. 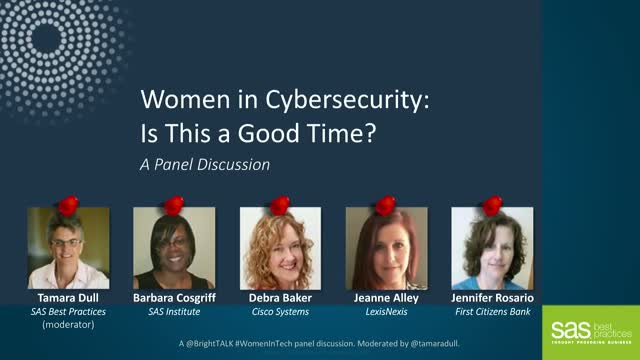 Title: Women in Cybersecurity: Is This a Good Time?